The mere sight of this on Indian roads, and most of the viewers would drop their jaws with awe. 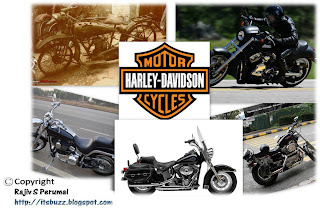 I’m talking about the sight of a Harley Davidson on Bangalore roads. The last time I saw one, it was for display at Leela Palace and supposedly belonged to the GM of Leela Palace Mr. Charles De Foucault. But come 2010 its no more going to be a rare sight! What I am talking about is the fact that Harley Davidson are going to hit the Indian Roads in mid-2010. After a 2 year negotiation with the Indian government regarding reduction in the 110% import duty, Harley Davidson have decided to price it at INR 7 – 15 lakhs (double of what it costs in the US) and create a niche segment for this bike. Harley Davidson would be entering the 7million strong Indian motorcycle market, which as of now has a very small percentage of super bikes. The superbikes sold in India are mainly the Yamaha R1, Yamaha R6 and Suzuki Hayabusa; which together sell about 400 bikes a year. According to Matthew Levatich, president and COO, Harley-Davidson they intend selling about 100 units a year and are initially bringing about 15 designs (the flagship Fatboy and Night Rod Special would be the first 2 models to be unveiled) out of their 43 existing models. They are also open to making other types of motorcycles and different engines which would be more suitable to the Indian riders. When will the Indian roads be good enough for consumers to enjoy these street kings to its fullest?